It’s the beginning of autumn (planetarily speaking) so the cicadas have gone, but I keep finding shells on the trees around the property and it brings the hot days of summer to mind every time. I love to hear the songs of millions of cicadas in the trees on a hot summer day; it reminds me that every season is short lived. A while ago I found a recording of crickets slowed down (on the net of course) and it sounded like a choir, I wonder what cicadas slowed down sounds like? 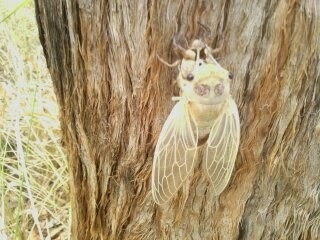 There are about 2000 species of cicada world wide; 220 of them are found in Australia. 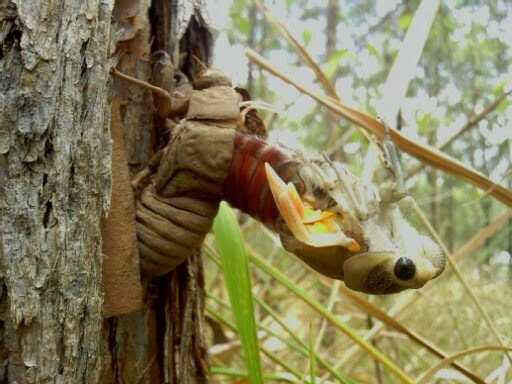 They have a really interesting and mysterious life cycle; spending years (up to 14 in some species) living underground sucking sap from the roots of plants and emerging in the summer,when sap flow is high, to sing, mate and be eaten by hungry birds and animals. They seem to be emerging earlier each year to me and an article in the Blue Mountains Gazette backs up that observation, stating that planetary warming is resulting in big changes in insect behavior. Around our humpy the emergence of cicadas in the early summer coincides with the hatching of insect eating birds like the black faced cuckoo shrike, butcher bird, magpie, satin bower birds and many others. The blue faced honey eater gets it’s food from nectar plants (as the name suggests) and fruit for most of the year but just before they lay eggs they eat large amounts of insects (to boost their protein levels, which boosts fertility) and they feed their young on insects too. The emergence of the cicadas fits in neatly with the beginning of the blue faced honey eater breeding season. I have also seen (only once) a koala eating cicadas like they were chips (absentmindedly but constantly feeding them into his mouth). 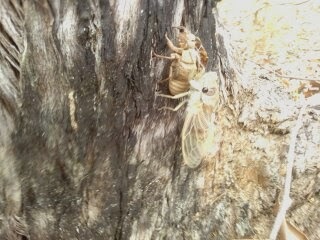 I think that cicadas provide a huge boost in protein for many birds and animals at a time when they have young or are breeding and that makes them a very important part of the ecosystem. I took these photos this summer while working around the humpy. 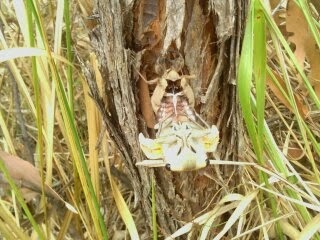 The adult just emerging from the shell, looks like an alien doesn’t it. What interesting insects have you found?